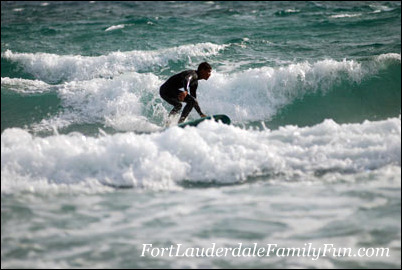 Deerfield Beach is the northernmost beach in the Fort Lauderdale area or Broward County. This could very easily be a favorite choice for a family beach. It is super clean and well-maintained. It also seems to be the beach with the most active people out and about. Although that can be true of other beaches in town, it just seems that a lot of people here enjoy playing beachside sports more so than in other area beaches. Travelling north on Ocean Drive, serious cyclists whizz by in groups looking like they were training for the next Tour de France. Surfers brave the early morning waves just north of the fishing pier, and joggers pace themselves as they take their morning run barefoot right by the ocean, splashing in the waves as they roll in. The beach volleyball courts are busy with players throughout the day, especially on weekends. And the paved walkway along the beach has a good mix of families with smaller children and seniors taking a stroll. There are metered parking spaces on the streets right by and close to the beach. Parking meters accept coins (quarters, dimes, or nickels) only, so bring lots of them. There is a small parking lot with meters on North Beach Pavilion on 21st Avenue but it always seem to be full, and parking on Ocean Drive right next to the beach is much more convenient. The boardwalk is the brick pedestrian walkway just next to the road and is dotted with covered pavilions with picnic tables and the occasional shower for beachgoers to wash off salty water and sand. There's something lovely about Deerfield Beach in the morning. No large crowds, the sun just coming up and beginning to warm the day. There is this fresh feeling walking with no shoes on the sand next to the Atlantic and breathing in the ocean breeze. The International Fishing Pier is right next to Kelly's Ocean Grille (already a long line for coffee just before 8:00 a.m.). 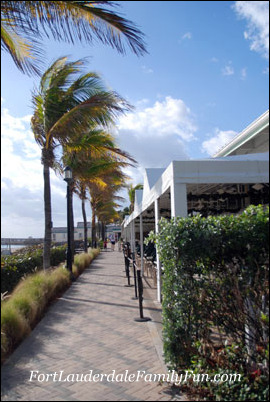 Kelly’s is one of the few restaurants with a full view of the ocean. Obviously, the tables next to the picture windows with these views are the hardest ones to get. 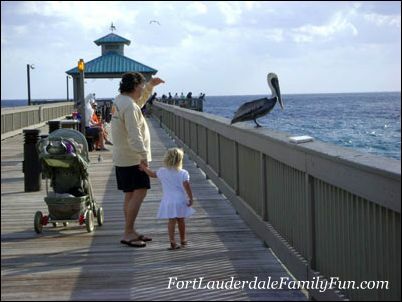 The fee to get onto the pier is $1.00 if sightseeing only and $4.00 for those who are fishing. 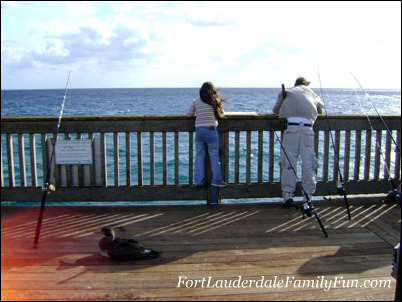 The fishing pier is well-kept and clean or as clean as a fishing pier can be. There are stations where people can cut bait or where freshly-caught fish can be rinsed with fresh water. It’s very relaxing just to be on the pier - watch people quietly fishing and feel the nice breeze from the ocean. 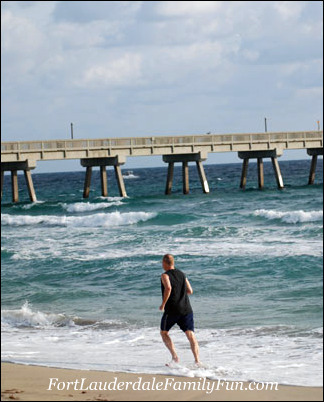 For more information on about the beach at Deerfield Beach, have a look at the city’s official website here. You’ll also find lots of other information aimed for residents as well as for visitors.